Pop all the ingredients into a bread machine on the dough setting. At the end of the programme, punch down the bread and knead on a floured surface. Roll into a rough oval or rectangular shape, the dough will keep shrinking back so persevere. Dust a baking tray with polenta and place the dough on top. 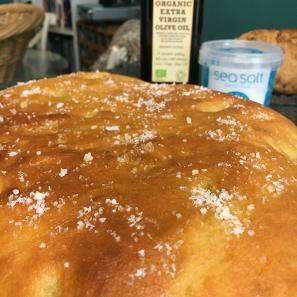 Drizzle olive oil over the dough and gently spread it across the surface with your hands. Using your fingers, make lots of deep indents all over the dough. Leave it to rise, until the dough is around double in height. Around 1 hour...it will depend on the season and warmth of your kitchen. Preheat oven to gas mark 7 and place a roasting tin with water on the bottom. When the dough has risen, pop into the oven for 15 minutes. I usually rotate the tray 180 degrees midway through. I then tend to turn my bread upside down and bake for a further 5 minutes, to ensure a nice firm base. At the end of baking time tap the base, it will sound hollow when baked through. Remove from the oven and place on a wire rack. Brush liberally with olive oil and sprinkle with sea salt. Even though it will be tempting to scoff straight away, leave to cool on the wire rack to allow the proteins in the bread to relax.